A deep trough enters W Europe with the associated cold front pushing across France and Benelux into W Germany. An upper ridge remains over Balkan peninsula and NE Europe. 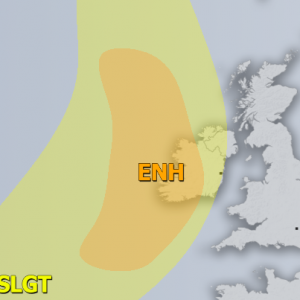 SLGT risk has been issued for areas NW of Ireland into W Irish coast with threat for severe winds in excess of 90-100 km/h. 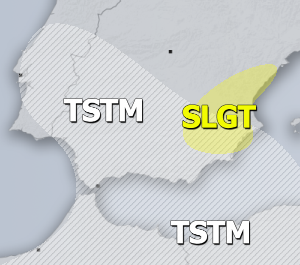 SLGT risk has been issued for areas E of Iceland with threat for severe winds in excess of 90-100 km/h. 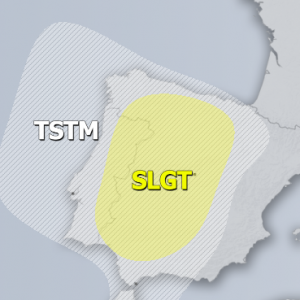 SLGT risk has been issued for SW Norway coast into Norwegian sea with threat for severe winds in excess of 100-110 km/h. 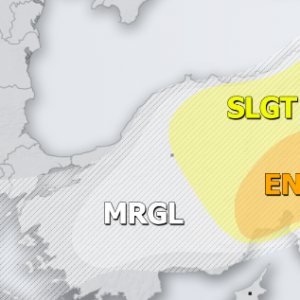 MRGL risk has been issued for NE France into Benelux and W Germany with threat for isolated severe storms, capable of producing strong to severe winds, marginal hail and heavy rainfall. Due to only marginal instability overlapping with moderately strong shear, some weakly organized convective line of storms are expected. 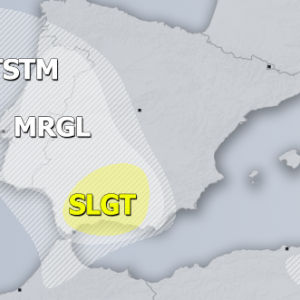 MRGL risk has been issued for N Morocco and NW Algeria with threat for isolated severe storms, capable of producing large hail, severe winds and torrential rainfall.